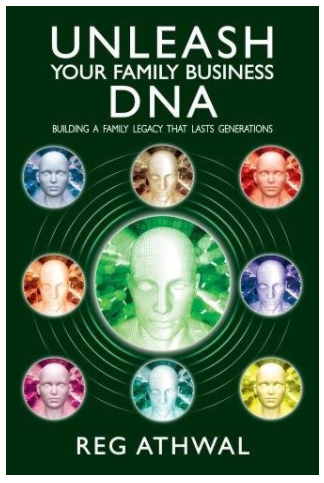 Will Your Family Legacy Last? 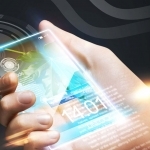 Will Your Business Continue to Grow? 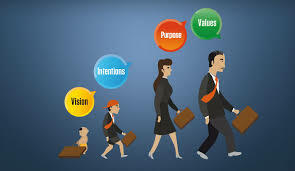 How Will Your Family Values Impact Future Generations? 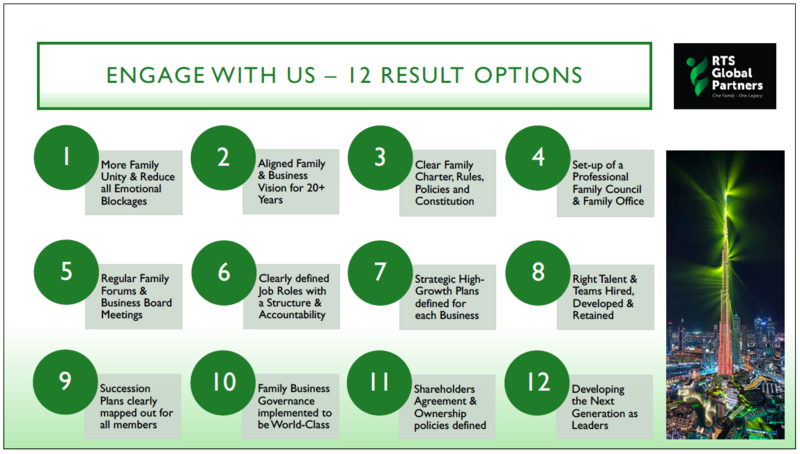 Do You Have an Aligned Family Vision for the Next 10 Years? 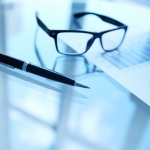 Do You Have a Family Business Governance Roadmap? 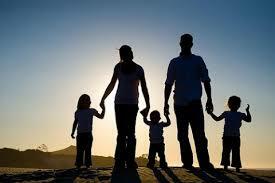 Do You Have a Family Constitution and is it Fully Implemented? 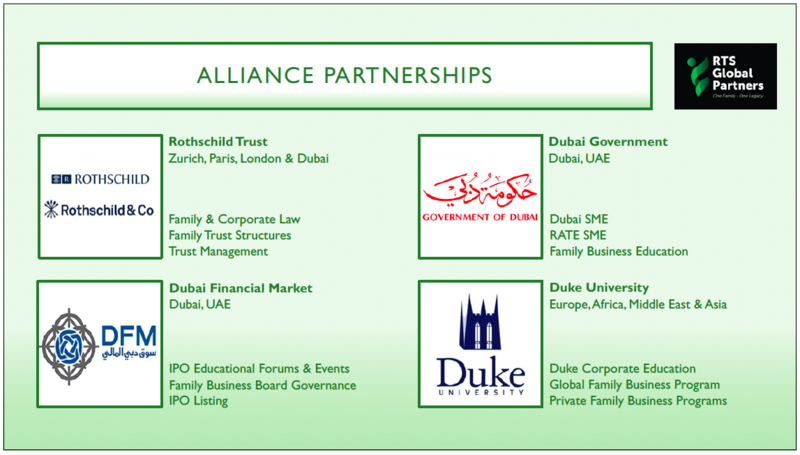 RTS Global Partners & Duke Corporate Education (wholly owned by Duke University-USA) has formed a Global Alliance Partnership and launching the Global FBM Program in April 2019 as a year-long quad-city program for Family Owners, Family Managers & Next-Generation Members. This high-impact practical program will run in Dubai, Mumbai, Singapore and London with a world-renowned faculty. 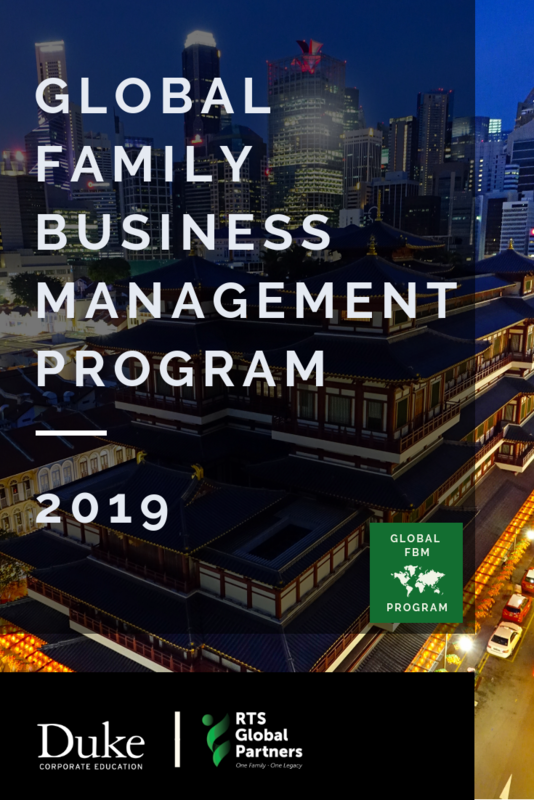 For more details quote #GFBM and email admissions@globalfbm.com or visit www.globalfbm.com for pre-registration interest, with guidelines for the application process and program fees. 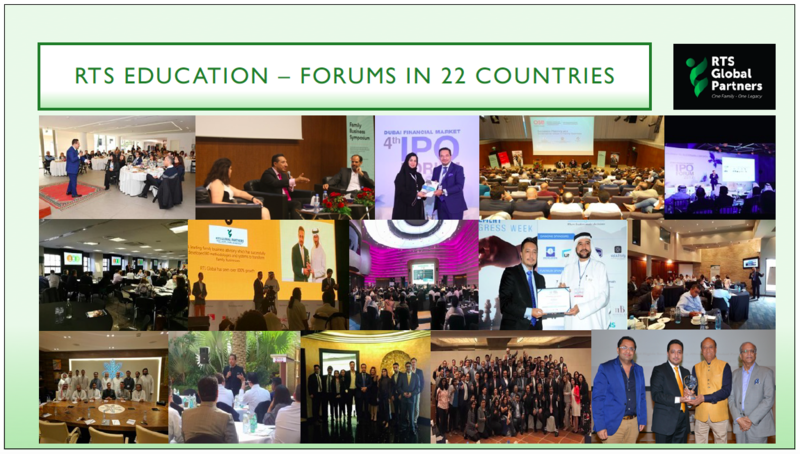 We have 18 full-time members and joint venture partners, who've advised, engaged and delivered programs to 122 clients in 22 countries, and we've hosted 46 private family forums, educating and impacting thousands of family business owners as part of our CSR initiative. We have a mission to impact 1 million families in 100 countries by 2033, with our integrated advisory, education, technology and investment solutions. 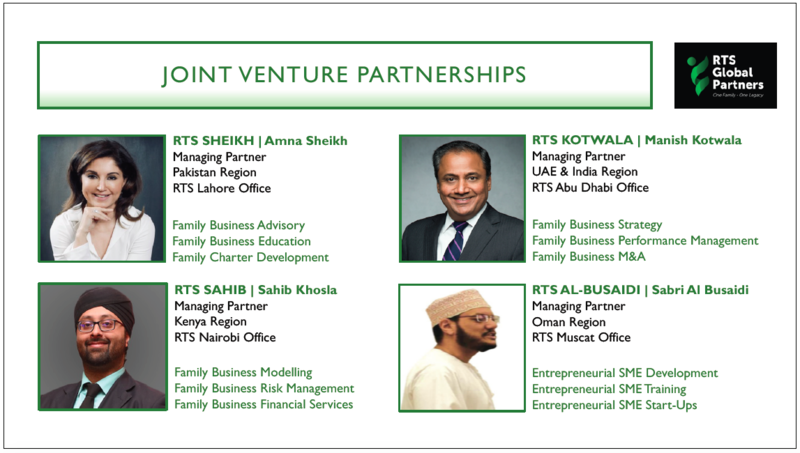 RTS has a world-class team of Directors, Executives, Joint Venture Partners, Alliance Partners and HQ Corporate Members as part of our growing RTS Family. Our Company DNA is all built upon the core values of RESPECT, TRUST & SERVE, expressed everyday to all our clients, to build life-long relationships. We work with retained clients who have business interests and investments in 33 different industry sectors throughout the world. 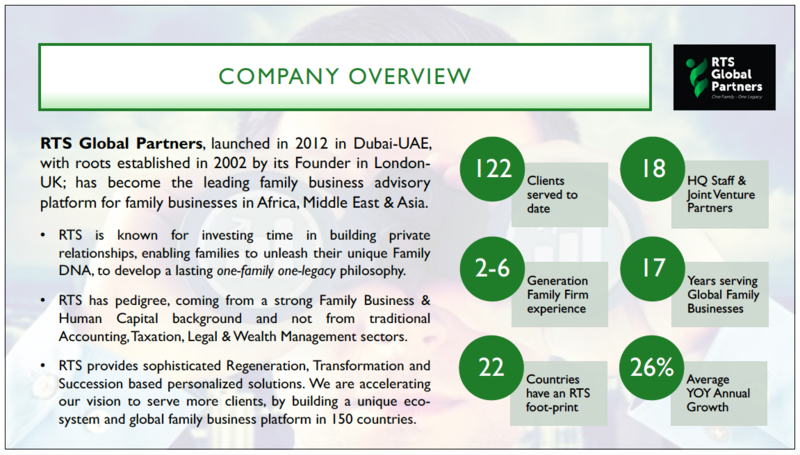 Our clients are mainly Tier 2 Family Owned Businesses ranging from $30m to $300m in yearly revenues and at 2nd or 3rd generation. 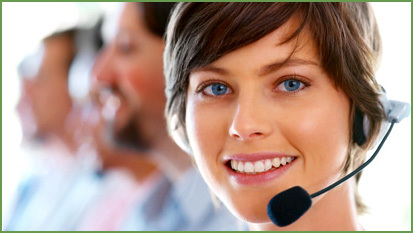 We also assist Tier 3 SME’s on a project-basis. I have attended other Executive Forums and heard Business Coaches, but they all sounded very ruthless towards people who run the business and are focused on methods to extract maximum monetary benefit from the skills of the employees. Such speakers can create a temporary coffee driven adrenalin rush, but their views are rejected the moment such an event is over. But when I heard RTS Global Partners yesterday, I was extremely impressed with the focus towards enhancing the value of the people who run the businesses. 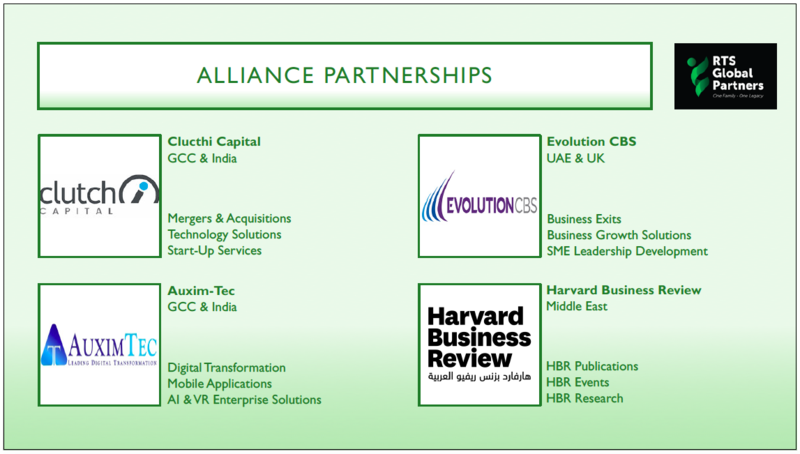 I felt a connection and found the session extremely relevant to my business and I certainly have an even higher respect for RTS Global Partners and will certainly engage with RTS Global Partners and attend future Executive Forums if invited. 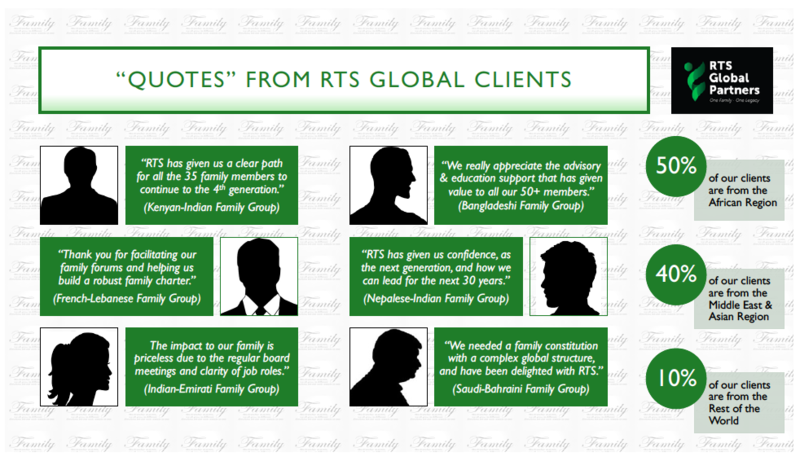 RTS Global Partners’ knowledge on people is superb! 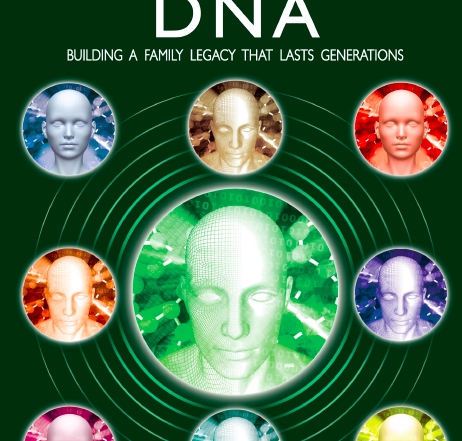 If you want to hire the best for your family business and ‘Unleash Your DNA’, then they are the right experts to consult. 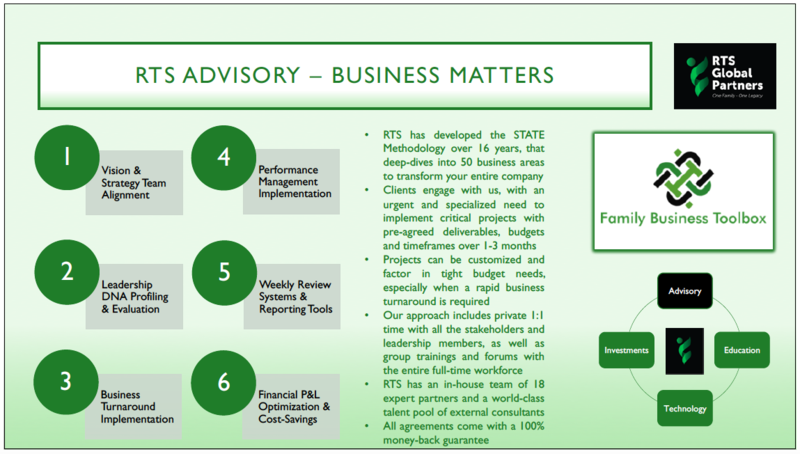 RTS are excellent business advisors and especially understand family business dynamics. They have been able to help transform our family business, tremendously improve our human capital and organizational strategy, that’s led to outstanding results and year-on-year growth for our Group. RTS professionalized the way we look at human capital, from profiling, to the hiring process to appraisals and exit. They helped us achieve alignment and clarity, and as our trusted advisors we look forward to meeting with them each time we work together. 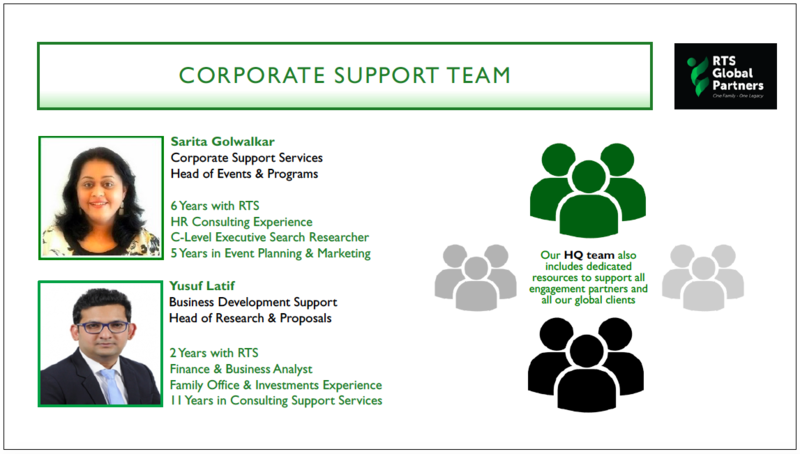 RTS have Partners with a high degree of emotional intelligence with fantastic communication skills, which helps them easily navigate sensitive issues in the Board Room with Family Members and Senior Managers. 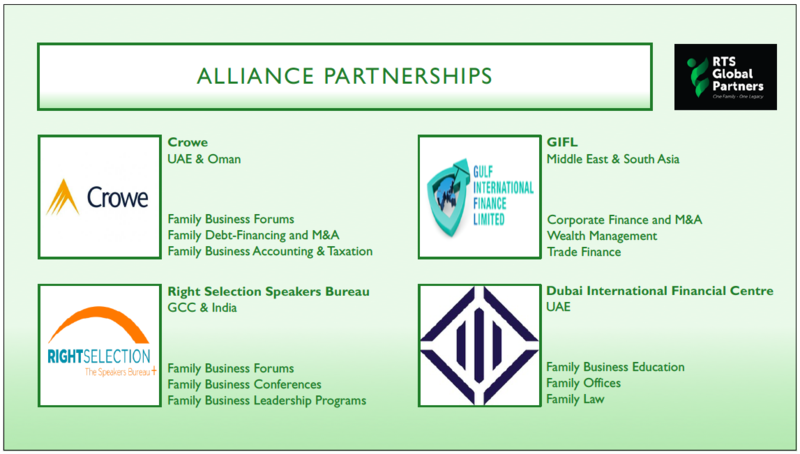 The Partners have become part of our family and company, which I believe entitles us to earn royalties if you use them! For most CEOs, the management of human capital is one of the important and biggest challenges, probably on par with strategy. So on behalf of our members, we were looking for an excellent high quality expert on the subject of human capital and talent management. Reg Athwal came highly recommended to deliver his master class for CEOs on ‘Unleashing Your Human Capital DNA’. Our members wanted to gain more insights into selection of people and interviewing techniques. We got much more than we bargained for! Reg introduced us to his ‘Human Capital Lifecycle’. We were exposed to the entire gamut of issues right from attracting the right talent – selection criterion and interview techniques to performance management and training and development. The presentation was highly interesting and interactive. The tools and techniques presented were laced with lots of examples and tips from his personal experiences. Apart from that there were occasions where we burst out with laughter due to the humorous quips by him. At the conclusion – the take home for most members was that they had a lot of fun and learnt very useful theory but more important practical tips and insights into probably one of the most challenging areas – finding, attracting, hiring and managing the right people for one’s business. 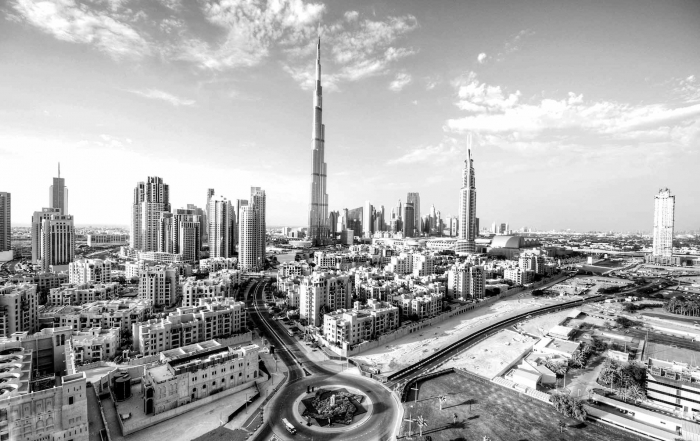 I’ve worked with a number of the top tier global recruiting agencies in the GCC and most have fallen quite short in terms of the vetting the applicants and the overall quality of the short-lists. I met RTS Global Partners and a Managing Partner, through an alumnus and we decided to give RTS a shot in helping us find a GM for one of our companies; their performance was without a doubt head and shoulders above any of the other Executive Talent Acquisition firms we’ve worked with. Their thoroughness, constant feedback, and sense of urgency were a breath of fresh air in comparison to our previous experiences. I couldn’t recommend RTS Global Partners’ services enough. I have worked with the RTS, over the last 18 months on a number of complex senior finance talent acquisition appointments. RTS has brought exceptional and talented individuals to the table, which have met all my specific requirements. The service is excellent, RTS always goes that extra mile and keeps in touch at every stage providing quality advice and guidance. 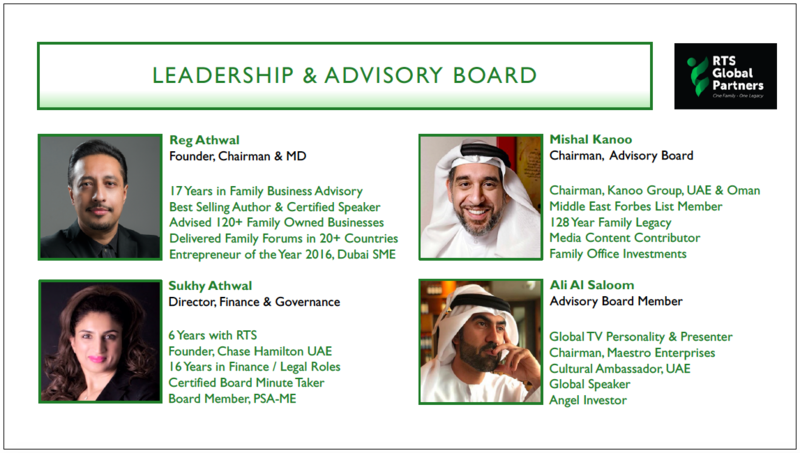 I have dealt with many traditional recruitment specialists over the years, I can thoroughly recommend RTS at both a corporate advisory and personal level, they are really exceptional, they have also demonstrated an in-depth understanding of the Middle East & Levant Markets. It is my privilege to share this reference on RTS. I am the Chairman of a Group of Companies in UAE, started in 1976 when I opened up our first wholesale garment business, which grew to numerous wholesale and then retail outlets by the year 2000. From thereon my 3 sons joined my business and since then problems kept coming up for 10 years, which I tried my level best to solve, but I could not find the solution. During this time I came across RTS Global Partners and my luck changed. It has now been 8 months since we engaged with RTS, and it’s been like a BRIDGE between my sons and me, where I can now solve my problems easily. When I retained RTS, I told them that I am selling my worries and problems to them and have come to buy happiness and growth from RTS. I am now fully satisfied and happy with the way things have progressed. No matter how much work a man can do, or no matter how big of a personality you create, one will not go far in business, until he works along with others in the family; a supportive role is necessary whether it is about building the family or business ground. I would like to thank Mr. Reg and Mr. Asin and all the staff at RTS. Many of my problems are now resolved and through RTS I came to fully appreciate what is the true value of a FAMILY CONSTITUTION. I’ve learnt how I can finally give happiness to our family, and we have succeeded in signing the FAMILY CONSTITUTION under the RTS UMBRELLA. We finally reached and achieved our goal, after many meetings and open communications. A big thanks goes to RTS in making this a reality. It is fact and truth in life, which I would like to share; you are your children’s HERO even though not expressed sometimes, also remember that in life we all have the world’s largest in-built and highly sophisticated video recorder, that is also embedded in your children’s inner-mind, so how you treat your parents, children, employees and customers is all recorded, and it will be get played back to you later on in life, when you least expect it. 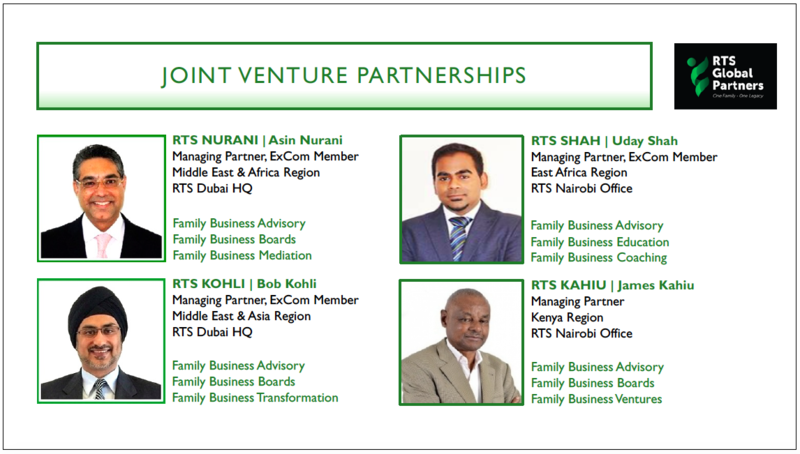 RTS has helped has realize these truths and led us to transformation at the family level. We now have the foundation to focus on transforming our businesses and creating a legacy. 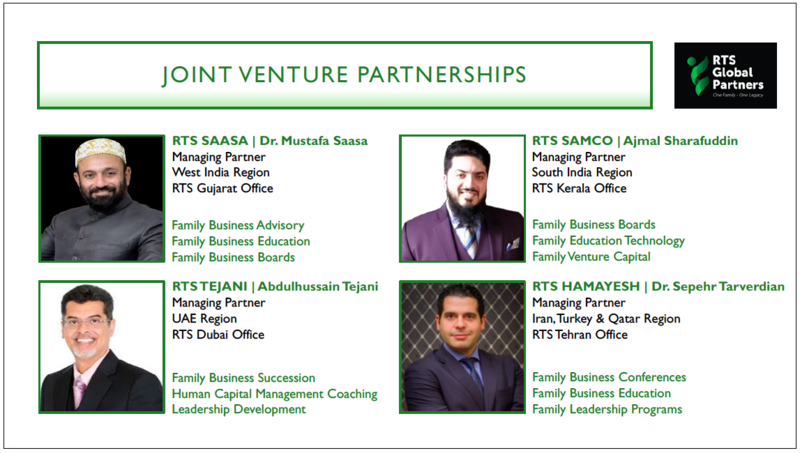 We intend to successfully grow the RTS Partner Platform and Eco-System to 100 Joint Venture Partners and establish RTS Offices in 100 countries by 2033, This means we can serve you globally with local knowledge. STILL HAVE QUESTIONS? CLICK TO CHECK THE ANSWERS! We will take time to understand your needs and can then offer you an initial 1:1 Private DNA Profile Intervention or Deep-Dive-Discovery (D3) or full Family Owned Business (FOB) Audit, that will deep-dive into 150 discipline areas of your business. You will be left with a high-level of clarity with immediate value, on what key areas we should focus on to transform your business. 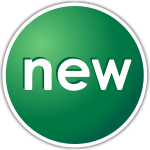 Your initial investment will have a 100% risk-free money-back guarantee. What is the history of RTSGP? the free articles in your email immediately!